You don’t have to be a diver to experience it, the reef is amazing enough with just a snorkel and some fins. I have snorkeled it twice with kids aged 7, 8, 10 and 11 and my 60+ year old mother, and everybody thought it was better than they imagined. I am not trying to sound like a commercial here, but there really is a kaleidoscope of color and coral as well as a crazy amount of fish, big and small. It was one of the highlights of our Australia trip, and I would recommend it to anyone with kids old enough to swim. Once you decide that the Great Barrier Reef is on your "To Do" list, there a few ways to see it. Most fly to the city of Cairns in northern Queensland as it is very close to the reef, has hundreds of hotels, and a huge tourist industry devoted to Great Barrier Reef excursions. We decided to try something different though and flew to Hamilton Island in the Whitsunday Islands. It is beautiful. The Whitsundays are a gorgeous collection of mountainous islands and the majority are uninhabited national parks. That means your views from Hamilton are unspoiled by development (but not Hamilton itself unfortunately). But Hamilton has done a decent job managing its development, centering everything around the marina and Catseye Beach and leaving the majority of the island untouched, as you can see in the picture above. Easy to get to. Direct flights from Sydney were fairly cheap ($250 round- trip when we booked), short (2.5 hours), and there are several to choose from each day. There also flights from Cairns, Brisbane, and Melbourne if you are coming from those cities. Good lodging choices. Accommodations are reasonable for what you get and where you are. The island itself is a private development now owned by the Oatley family, which is interesting only because it explains why you see so much of their wine label Wild Oats in the local liquor store. Most of the accommodations are owned by their development corporation, but there are some private homes as well. I used booking.com and Airbnb to get an idea of what was available. See "Tips" below for where I have stayed. No traffic. There are no private cars on the island, except for maintenance vehicles and a few airport shuttles. Otherwise, everyone uses golf carts or the public shuttle bus. It makes sense as everything is fairly close together so there is really no need for cars, though the hilly nature of the island makes for a hard walk for some. The kids loved riding in the golf cart. I mostly walked because I like to. Proximity to the Great Barrier Reef. Hamilton Island is close to the Great Barrier Reef- not as close as Cairns but still only about an hour and a half by boat. I have taken a snorkel trip both times I have visited Hamilton Island and while the day was long (9am- 5pm), it was full of snorkeling and the beautiful cruise through the Whitsundays was a treat in itself. A great beach. Cairns doesn't really have a beach except at low tide and even then it is small. 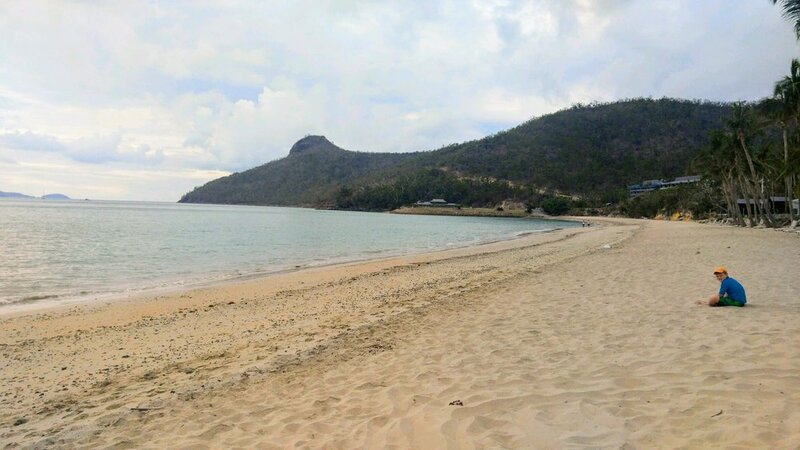 Hamilton Island has Catseye Beach, which may be the only one but it is large enough that it never feels too crowded. There are are sailboat, kayak, and paddleboard rentals on the beach, and I would encourage you to get on one. A small reef lies just off the beach and I have seen a sea turtle both times I have paddleboarded over it. There is a surprisingly large tidal difference though, so at very low tide, the beach is more like a giant mud flat. That’s when the nearby swimming pools come in handy. Other activities. Hamilton Island offers plenty of activities besides just the beach and the Great Barrier Reef. I enjoy a good read by the ocean as much as the next person but only for so long. I like to have options and you can find them here. You can hike several trails to the peaks of the island or to the isolated beaches on the far side of the island. Our hike to Passage Peak was one of the activities the kids mentioned later as their favorite. (See "Tips" below for the details.) You can also enjoy kayaking, paddleboarding, jet- ski tours, sailing, dinghy rentals, ATV rentals, bowling, mini golf, regular golf, and other kid-friendly activities that the island can arrange. There is even a small zoo where you can pay a wad of money to cuddle a koala if you are so inclined. Half day trips to nearby Whitehaven Beach or Whitsunday National Parks are also a great option. A downtown area. Restaurants, bars, a bakery, grocery store, and Explore's dive shop are located near the marina in a small commercial area on Front Street. The marina is fun to walk around as well, as it usually has some Russian oligarch worthy yachts there. It is getting more crowded. I was really surprised this past trip (Oct 2017) by how many more golf carts there were and the wait times at some of the restaurants. One of the days we were there a cruise ship arrived and disgorged a seemingly endless number of passengers. Avoid Front street on these days. The beach and pools were still enjoyable and not too busy (even on the cruise ship day) but it was a little harder to find your quiet moment than it has been in the past. The hike to Passage Peak was the best way to accomplish that- we only saw a few people along the way and had the peak to ourselves. It is not the cheapest place. Between the accommodations, food, and activities, you can easily spend quite a bit of money on this island. None of the prices are really shocking considering where you are (especially as I find Australia to be expensive as a whole), but it adds up quickly. This is one of those places where I keep a close eye on the budget and bring some food from the mainland with us in our suitcases. You will not be alone. If you are looking to get away from it all, then this might not be your place. It is definitely a resort development and the buildings are all quite close to each other. On the other hand, it makes getting around easy and if you have kids, it means there is a lot for them to do. There are 3 high-rise condo buildings on the island but the majority of accommodations are 2-story condos or hotels. Places on the west side of the island are closer to Front Street and have a view of the sunset whereas most of the other rentals are located on Catseye Bay, closer to Catseye Beach and the resort pools which is handy as well. I have stayed in the high-rise Whitsunday Apartments, one of the high- rise condos across from Catseye Beach. This is a fantastic place for the money. It is only 1 BR/ 1 BA but the rooms are huge and sleeps 5 people comfortably (if at least one is a kid). The view from the deck is outstanding and well worth spending a little more to be on at least the 4th floor so you can see over the palm trees. I have also stayed in Shorelines which was wonderful as well. These condos have 2 BR/ 2BA spread out over 2 floors, so it had a little more room than the Whitsunday Apartments which was nice for the 5 of us. It also had a washer/ dryer that we put to very good use during our stay. Shorelines is on the west side of the island so you get some pretty amazing sunsets and the complex also has a private infinity edge pool. 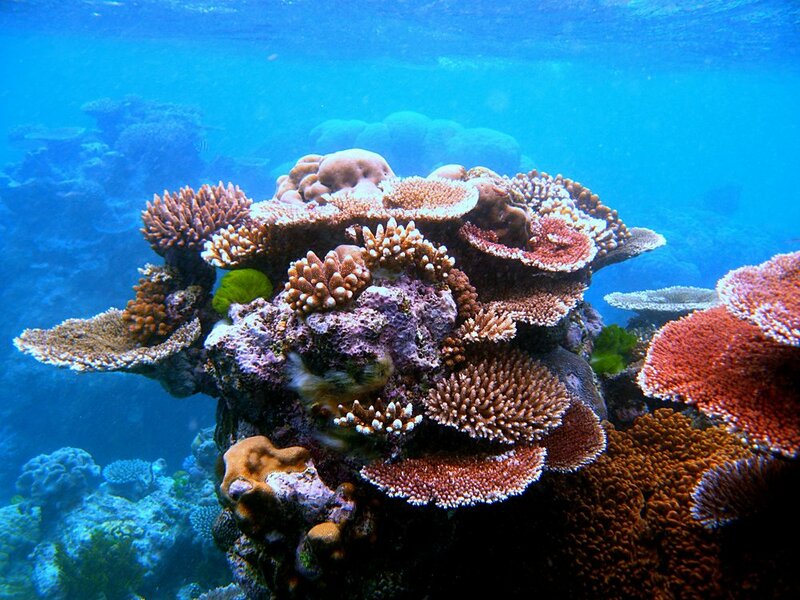 We booked our Great Barrier Reef snorkel trip through Explore. Twice I have used them and twice it was great. They keep their numbers smaller than Cruise Whitsundays Reefworld excursion which is your other main option unless you want to charter a private boat. Explore's staff was excellent, the equipment was great, and the boat was very comfortable. I also like that its headquarters is located on Hamilton Island. Take some Dramamine with you and do not drink too much the night before. The last half hour of the boat ride to the reef (or the first half hour on the way back) is through open ocean and it can get some big, rolling swells. One of my snorkel trips was a breeze and one trip had over half the folks on the boat hanging off the back. It all depends on the weather that day. The good news is that while you are in the Whitsundays, the water is considerably calmer. Queensland does not distinguish between golf carts and automobiles as far as driving requirements go. Meaning you will need a valid driving license, you must be at least 21 years old, be under a %0.05 blood alcohol limit, and kids under 4 must be buckled into car seats. Caught breaking these rules and the police on the island will stop you. There have been several well publicized accidents on the island so they take the safety thing fairly seriously. I ended up walking most places anyway as we had five people in our group and they are very strict about 4 people maximum in a cart. Like I said, nothing is really that far from anything else so walking was mostly easy (except for the hills). If your place doesn’t come with a golf cart, I wouldn’t worry about renting one as the free shuttle does a decent job of getting you around. Besides, I think the day rate for the golf carts is crazy expensive. The best swimming pools are by Catseye Beach. The kids loved the Bougainvillea Pool across from Whitsunday Apartments while adults will like the swim-up bar at the Main Pool by the Resort Center. Some of the individual complexes have pretty cool private pools as well, but the kids liked going to the big pools so they could meet other kids there. The kids loved the huge Bougainvillea pool. But they also appproved of the infinity pool at Shorelines. Look for the fruit bats at sunset. These are the biggest bats I have ever seen and we were fascinated by them. They fly around the palm trees in the evening, particularly around the Bougainvillea Pool. Their numbers were hit hard by Cyclone Debbie in 2017 and here’s hoping they quickly make a comeback because they really were so cool. Do not leave any doors open at any time at your accommodations as the cockatoos are numerous and sneaky. Everyone loves them at first, but you quickly realize that they are, as my nephew puts it, "a pest with a crest." If you don't have a place with a west-facing view, then go to the top of the island by the One Tree Hill cocktail bar for the sunset. You can buy a glass of wine or bring your own to the picnic tables nearby and enjoy the colors. You'll find quite a few people up there which creates a festive atmosphere. The cocktails at One Tree Hill are AUD $10 and the wine starts at $8, so not too bad. It is a pretty great place for a drink at any time of day, and they have non- alcoholic mocktails (my nephew was obsessed with these) as well as ice cream for the kids. Not quite the sunset but you get the idea of the views from One Tree Hill. Grocery Store- The IGA is well- stocked and the prices are not the worst but we still brought some food from home in our suitcase, such as mac n’ cheese and peanut butter. The views from your accommodations are likely to be outstanding, so why not eat there? There is a liquor store next door to the IGA. The prices are not good but not terrible. We drank mostly wine as it was the most economical. We often ate lunch out and then either cooked at home or had take-out for dinner. For take-out, I recommend the pizza from Manta Ray. Two large pizzas from Manta Ray fed 3 adults and 2 kids comfortably but I would skip the garlic pizza appetizer, it was a disappointment. If you like fish n' chips, then the take-out from Popeye's was excellent. One order is enough for 2 adults (excepting those people who can really go to town on some fried fish.) The wait time for Popeye’s is massive if you go after 6pm, but it works great if you order as soon as you get off the boat from your Great Barrier Reef trip. Everyone is tired anyway so take-out is a great option for this day. If there is a restaurant that you particularly want to go to, book online or call ahead of time to make sure you can get a table. I was surprised by how quickly the wait times skyrocketed in the evening for some places. Here is a great trail map so you can see all the available hikes on the island. If you are thinking about taking a hike, start early. We didn't get to the trailhead for Passage Peak until just after 9 am and it was blazing hot by the end. Partly because of the time of year (October) and partly because all of the shade is gone (thanks Cyclone Debbie), but mostly because we should have started at least an hour earlier. Passage Peak is a steep hike but fairly short at about 5K roundtrip. I am not kidding about the steep though, the last 200m or so is solid stairs and the there are small sections of stairs before that. It took us about 2 hours total and we hung out at the top for awhile enjoying the breeze. Take water! More than you might think you need. We only brought about 20oz per person and could easily have drunk more. Again, the heat was more than we were expecting and there was very little shade. Read the warning signs if you are hiking to the beaches on the far side of the island because there are jellyfish in the summer months. I was concerned about snakes because Australia has such an interesting and deadly collection of them. We never saw any but another person on the trail did. I don't know what kind it was, but I take comfort that there has never been a fatal snake bite recorded on Hamilton Island as far as I could find. The non- stair part of the trail to Passage Peak. It is still up. Saddle Junction where several trails diverge. Download the Hamilton Island app before you go. It lists the activities available everyday and will let you know of any special, rainy day, kid activities. Also look for daily family activities such as bingo, movie night, or bounce castles. If you don't want to download the app, look on the website for the weekly activity guide. We loved our two trips to Hamilton Island and would go again if the opportunity arises as there are still activities we haven't done. There are other islands and towns in this part of Queensland that also look great, but it's hard to beat the combination of accommodations, activities, and convenience of Hamilton island. I hope you have a great trip down under!